PARIS, FRANCE - JUNE 13: People sitting on grass hill at Sacre Coeur in Paris, France on June 13, 2018. 4k00:17PARIS, FRANCE - JUNE 13: Establishing of Sacre Coeur exterior in Paris, France on June 13, 2018. 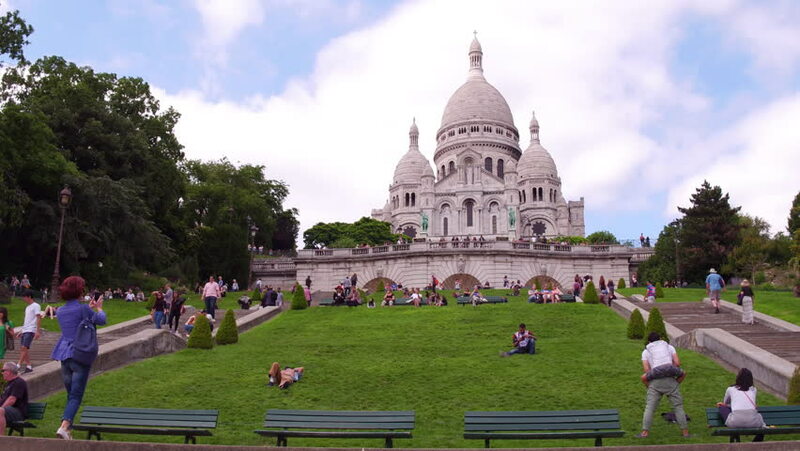 4k00:12PARIS, FRANCE - Aug 15, 2014: Tourists in front of Sacre Coeur Cathedral. It was designed by Paul Abadie. Construction began in 1875 and was finished in 1914. 4k00:14France, Paris, August, 20-2018, view of sacre coeur Basilica in Montmartre district.